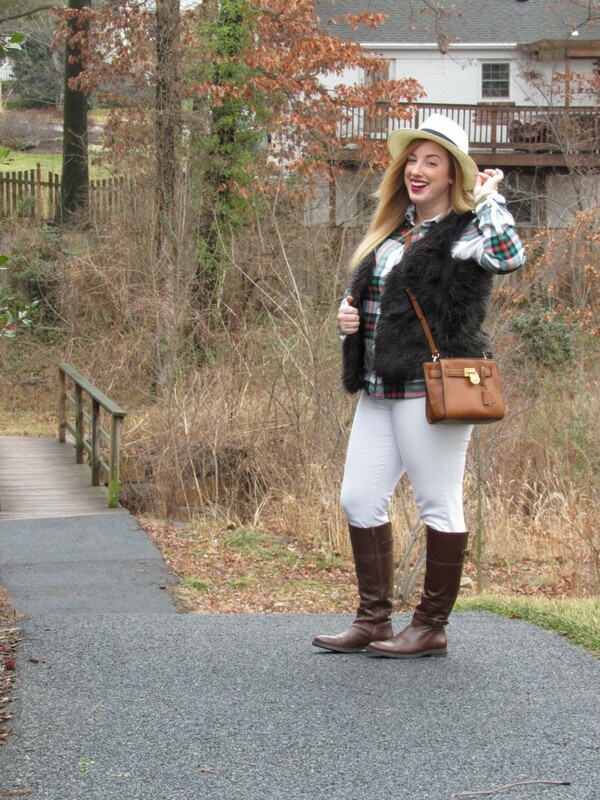 Winter whites is a tricky look to pull off. 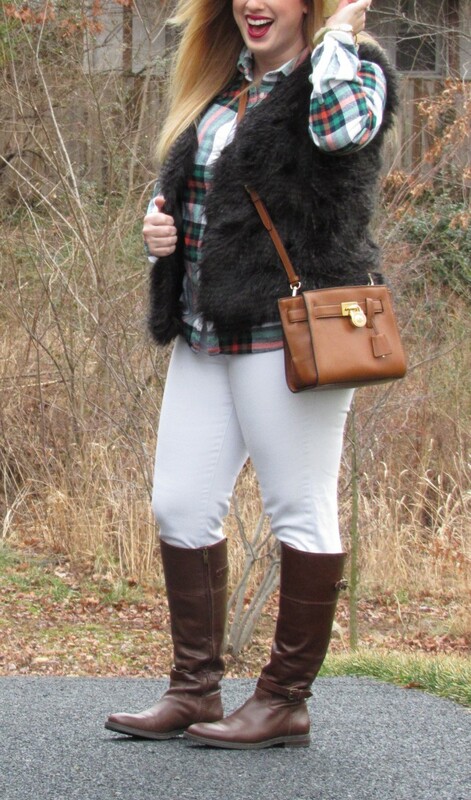 I am a fan of wearing white, but this look during winter forced me to step outside of my comfort zone and try something new. Weeeeee! Does this hat look familiar?? It was my favorite Summer hat, I can’t believe I am pulling it out during the chilly winter season. 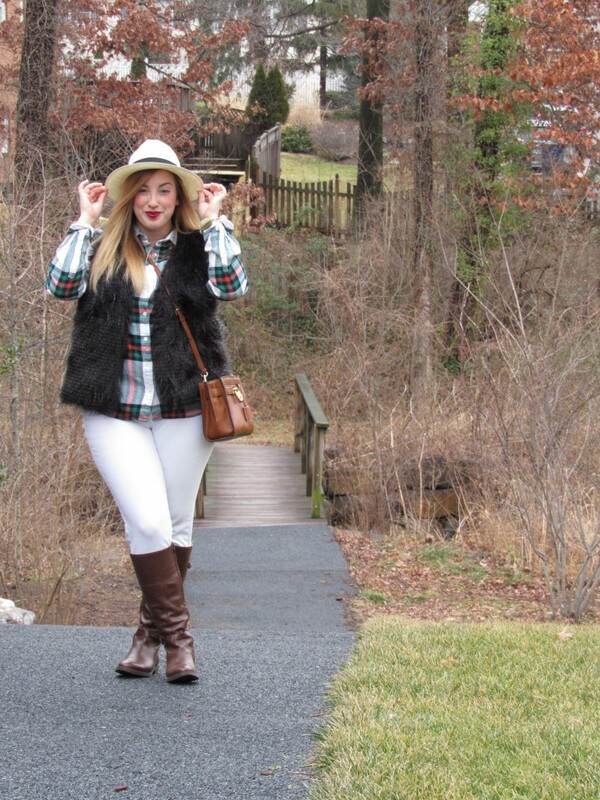 My white hat and my white pants, for a not-so-white winter here in DC. 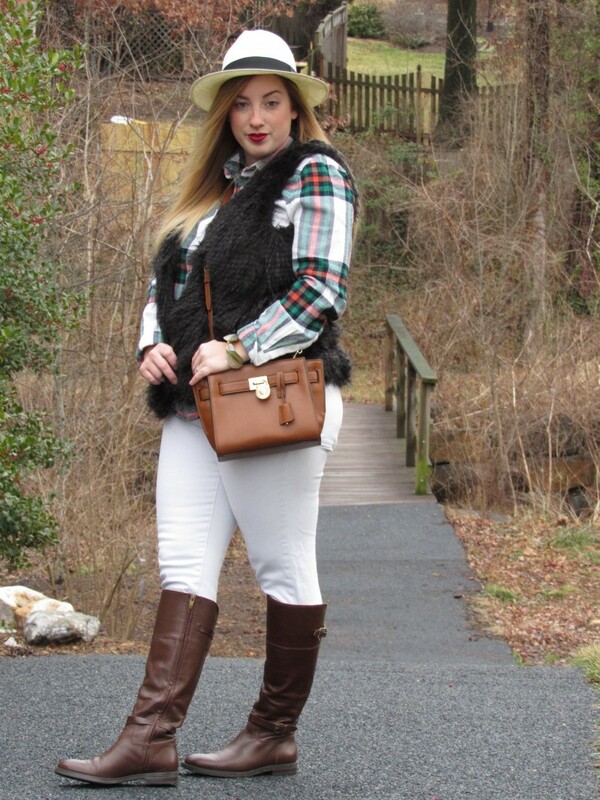 Normally I would not wear white outside of season, but I had this crazy idea in mind, and I am glad I tried it. Let’s be honest, white may not be the most flattering color on me but I am fine with that. 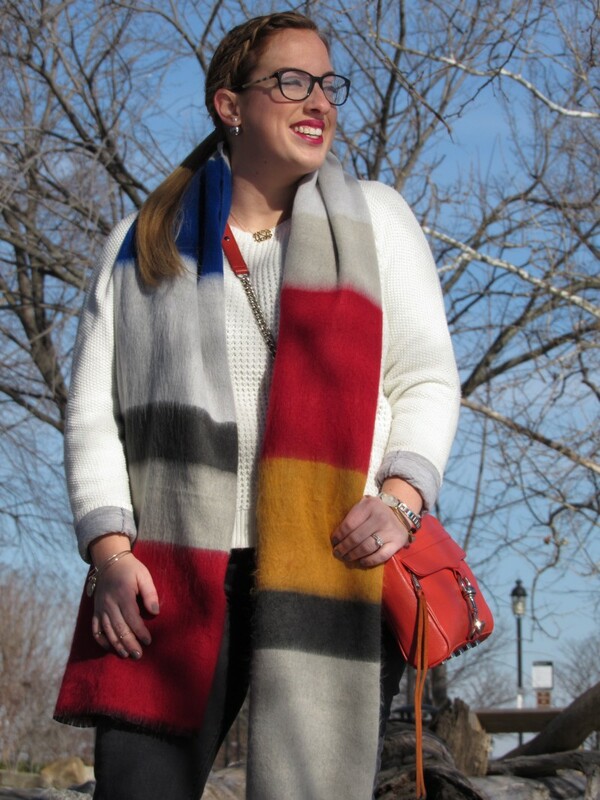 My advice for pulling off white in winter is move to south florida where people wear white all year around… Ok, Ok, I am only kidding (kind of)! 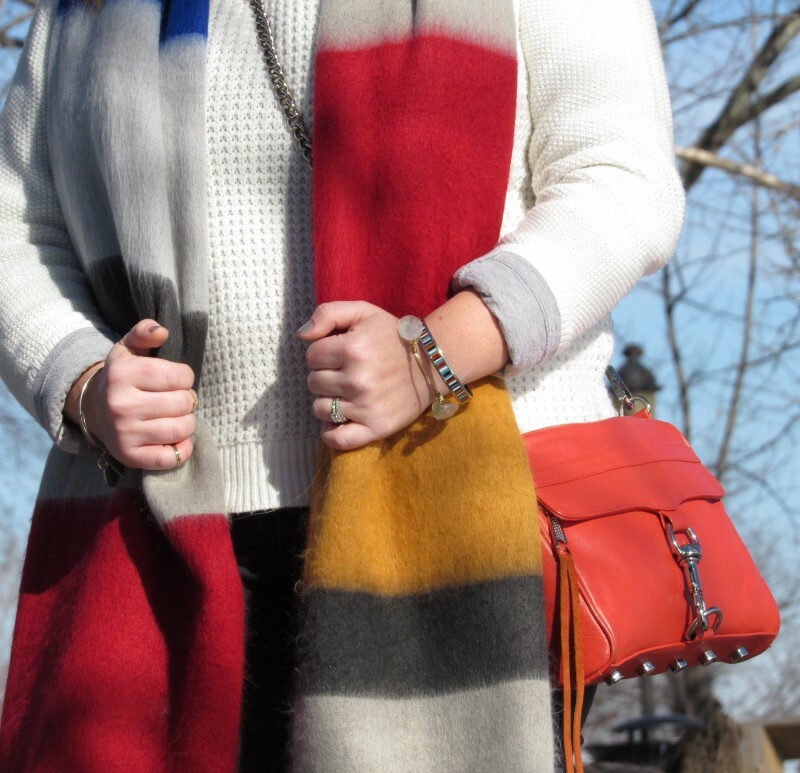 I believe winter whites should pair white with deep and dark colors. White looks great against reds, navy, hunter green, browns, and black. 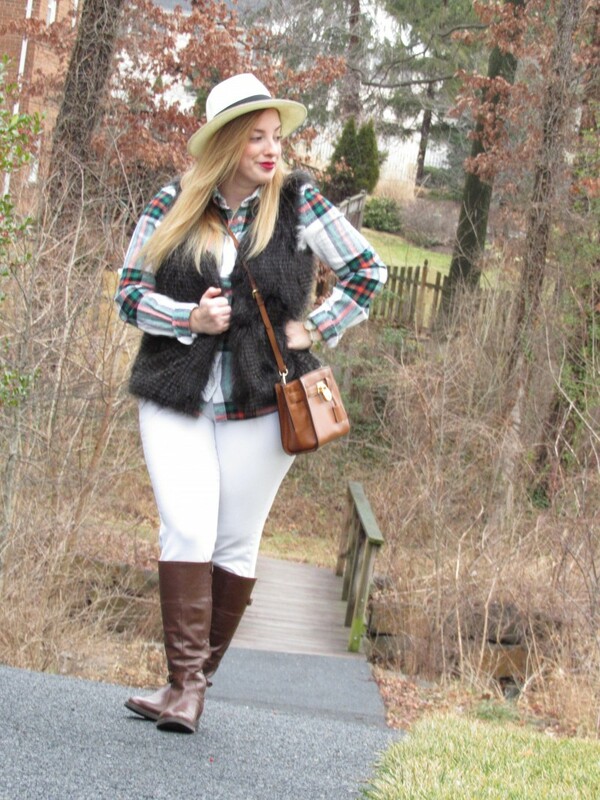 Do you wear white in the winter.. please share your tips for pulling off the look! Snicker Doodle Mix for Movie Night! 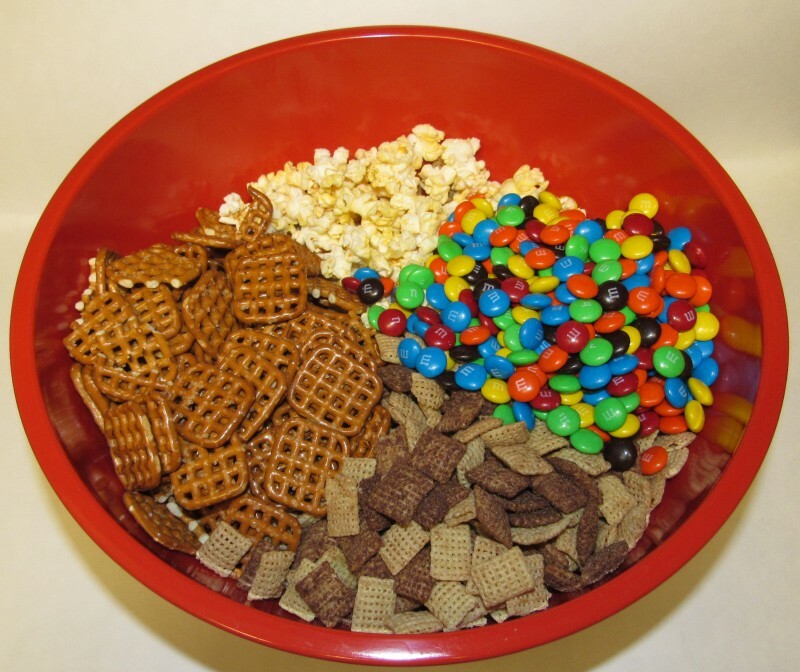 Spice up movie night by adding a bold twist to your typical popcorn bowl. 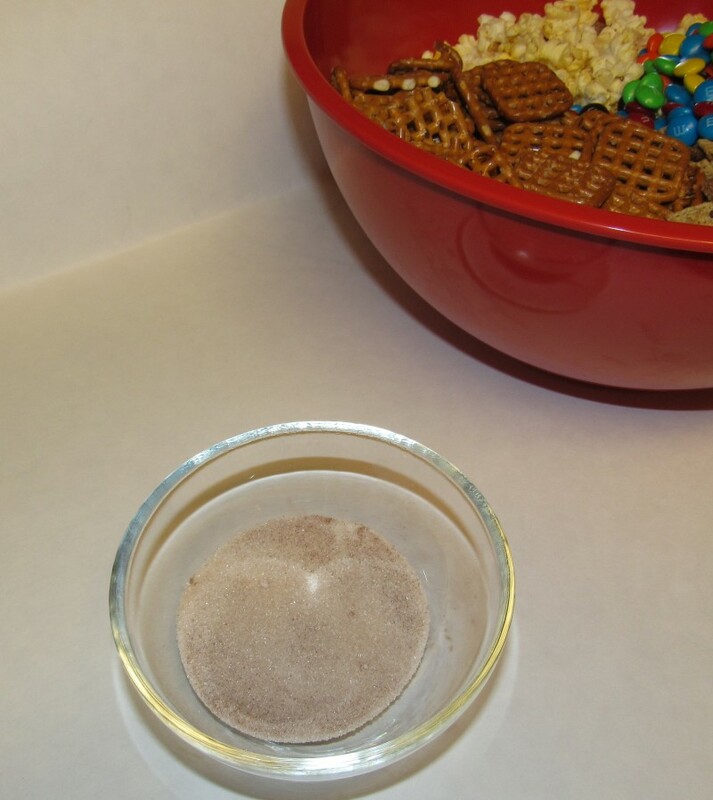 This snicker doodle mix with popcorn, pretzels, chex, and M&M’s is the awesome blend of sweet and salty! 1. 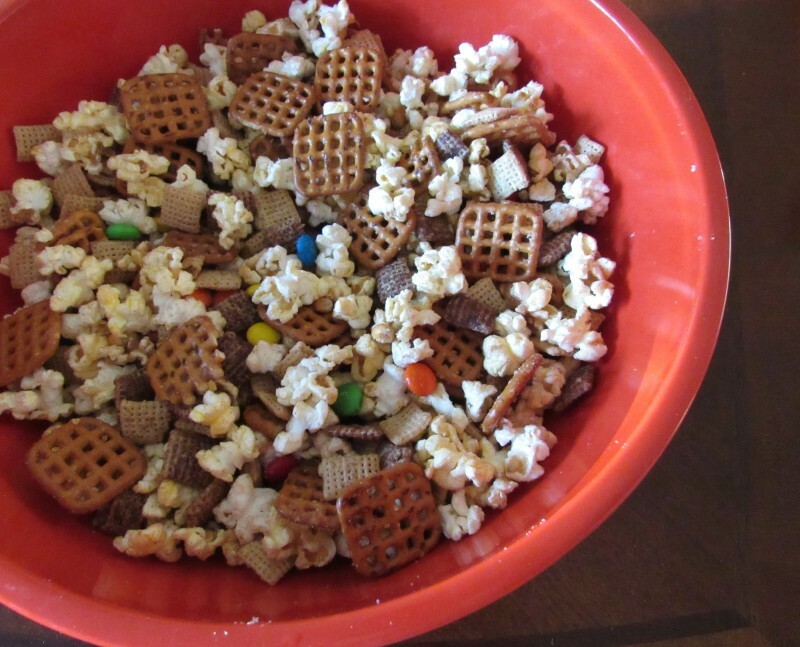 Mix the chex, pretzels, M&M’s, and popcorn in a large mixing bowl. 2. In a small bowl, mix the cinnamon and sugar. 3. In another small bowl, melt the butter in the microwave. 4. Pour half of the butter over the mix, then sprinkle half of the sugar/cinnamon over the mix. 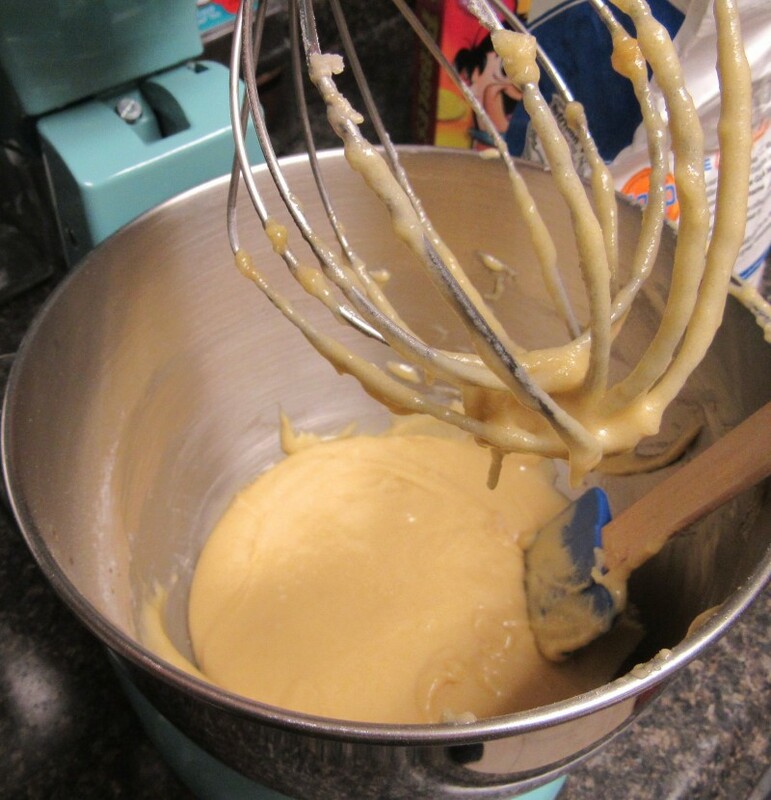 Use a spatula to stir/fold the butter and sugar into the mix. Then add the final butter and sugar- and mix stir and fold until all of the mix is lightly coated in the seasoning. Our friends had us over for a PJ party & movie night this weekend, so of course I wanted to bring a sweet treat to punch on during the movie! Popcorn was the first thing that came to mind for movie night (duh), but I thought that was too boring! 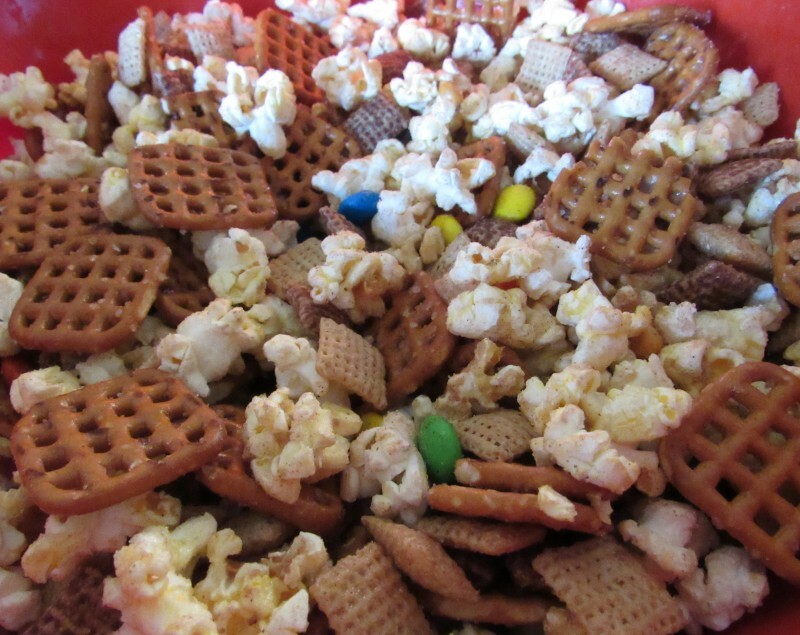 Jason and I love sweet and salty trail mixes, so I wanted to create my own! We had such a good time at movie night with our friends! You are never too old for a PJ party.. it makes for a casual, stress-free night! I highly recommend planning a PJ & movie night with your friends; it is the perfect winter activity!! TGIF! 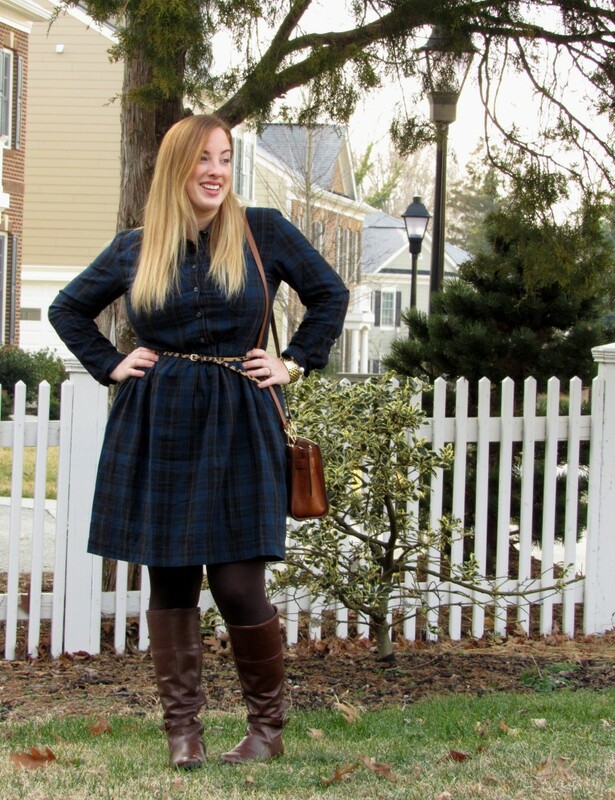 Nothin’ I love more than a dress that I can wear to work then grab dinner in after… wait, it gets better.. this plaid dress is on sale for less than $15 dollars at the Gap (in-store sale) – boom! 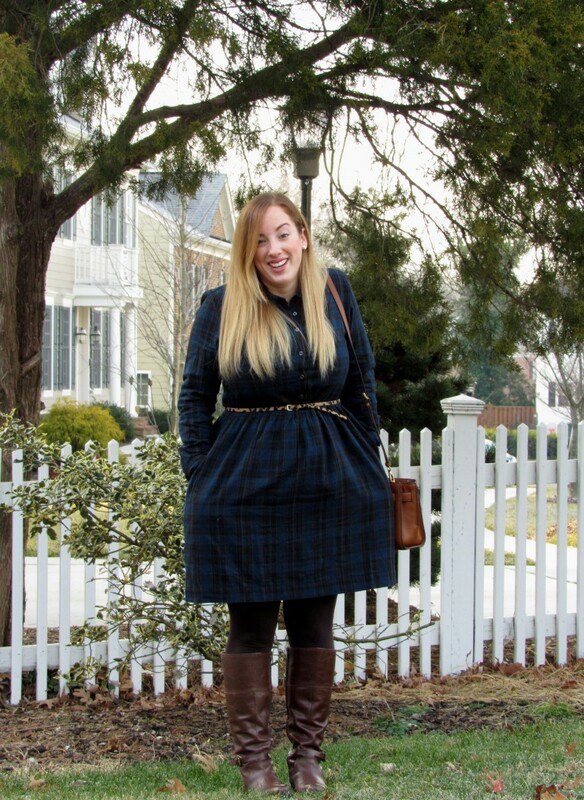 I can not get enough plaid (and donuts) these days. 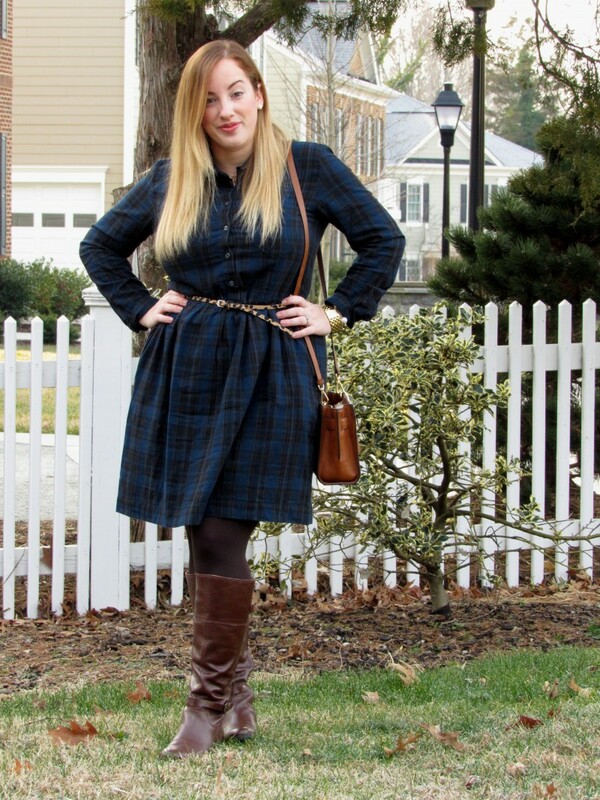 I am holding onto plaid until Spring is upon us and with snow on the forcast tomorrow, spring is no where in sight. Run, don’t walk… each of these items in this post are on sale now! 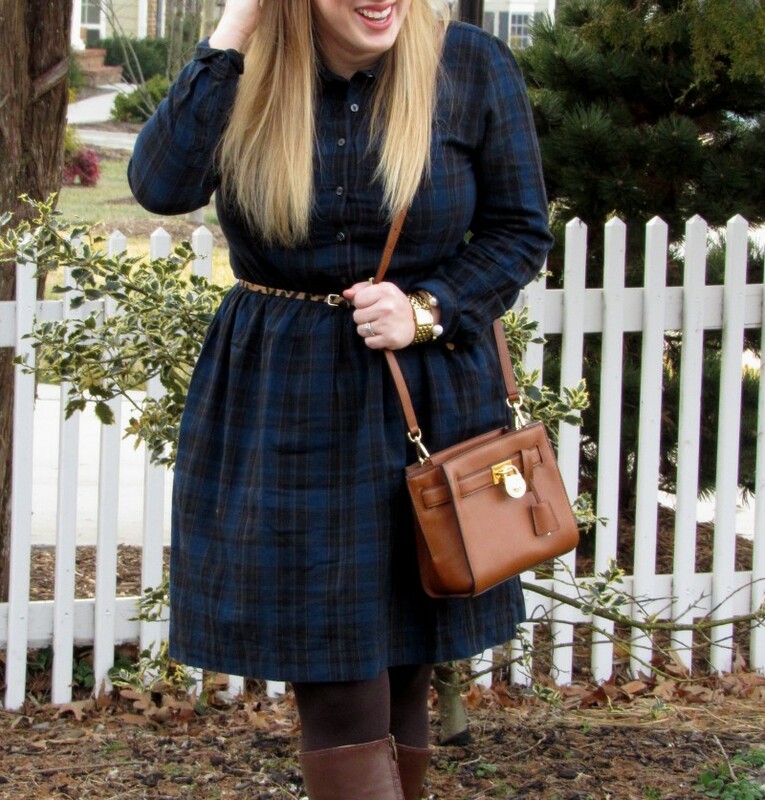 This dress was on sale IN STORES for $13, my kinda deal! This girl has been crazy busy working on some fun projects to kick off 2015. Look for some new items in my Etsy shop coming soon! Also, I am working on my first custom wedding signage & I can’t wait to share it with y’all in a few months down the road!! 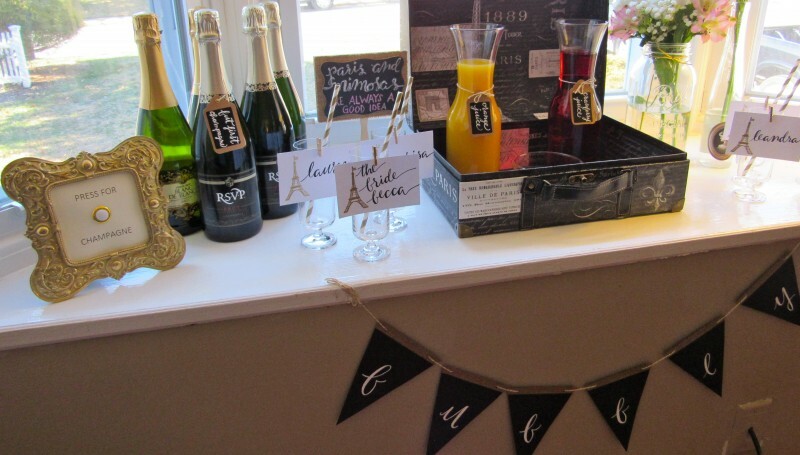 12 Tips for Planning & Hosting a Bachelorette Party! 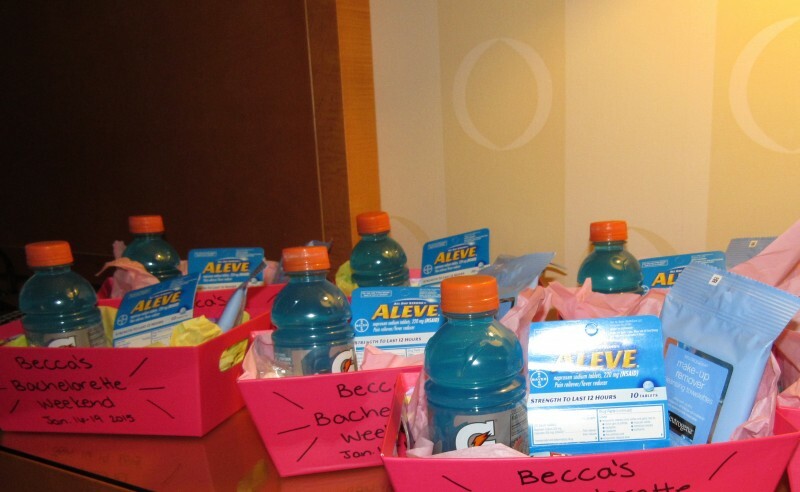 I have spent the past few months helping to plan my best friend, Rebecca’s, bachelorette bash. The best part was that I was able to host it here in DC!! 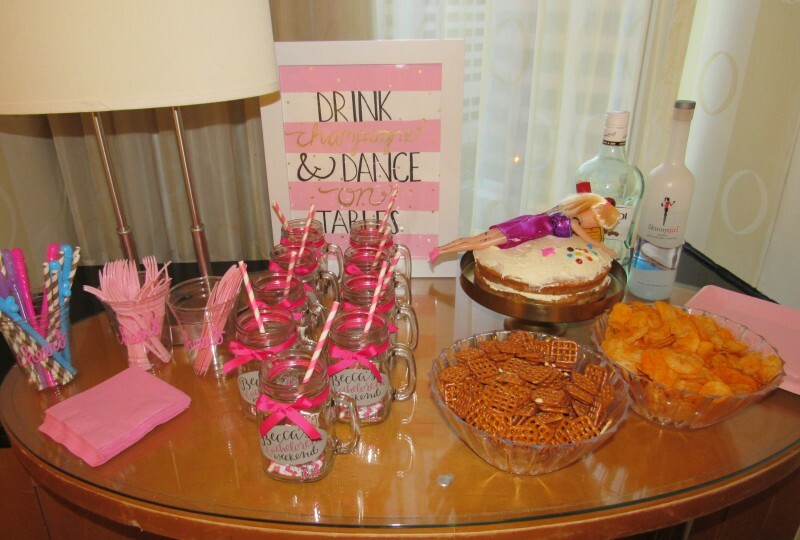 Here are 12 tips on how to host/plan a bachelorette party!! I am sorry that I was a little MIA last week, I was finishing up several crafts for my friend’s bachelorette party. I had a phenomenal time hosting my sweet friend’s bachelorette party this past weekend. So much so, that we (I think i can speak for all of us) are going to be struggling this week, if you know what I mean. 😉 All of my BFF’s threw me an awesome bachelorette party for me, so I wanted to make sure Becca had an amazing weekend that she would never forget!! After all, how often do you get to have one big slumby with all of your biffles, with all attention on you?! Planning these events can be stressful at times because you want to make sure everyone enjoys themselves. 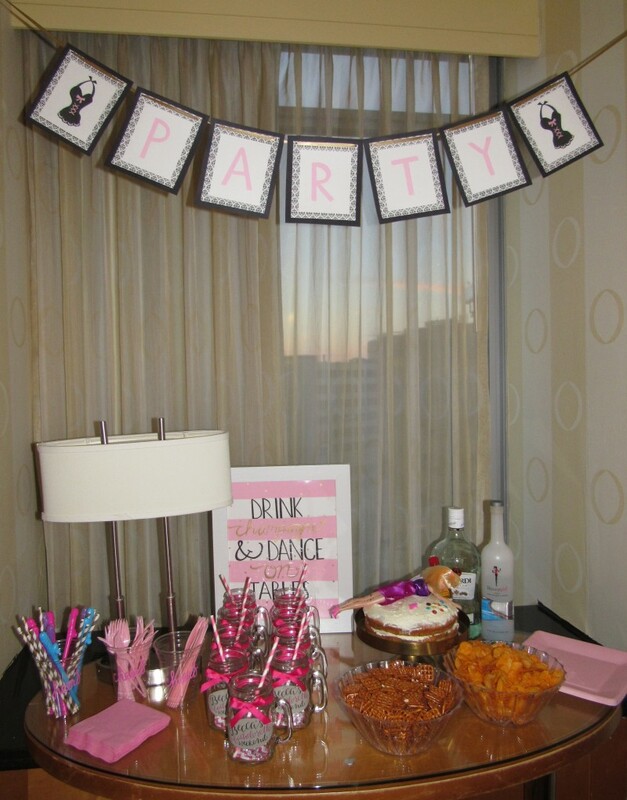 I am excited to share my 12 tips for hosting a bachelorette party! 1. Choose a city or a historic town with character // Pick a city or quaint town that is accessible to all (or most) of the friends in your party. For instance, If every girl lives on the east coast, choose a destination on the east coast. Choosing a location can be difficult If your girls are spread out. It is important to keep in mind some girls may be able to drive and some girls may have to fly. Here are some recommendations of cities for a bachelorette party: New York City, Washington DC, Nashville, Orlando, Miami, New Orleans, Philadelphia, Boston, Austin, Dallas, Los Angeles, San Francisco, Denver, & Los Vegas. Historic towns: Savannah, Charleston, Charlottesville, Richmond, & Williamsburg. 2. Pick a theme or color scheme // Everybody likes to contribute to the party, so it is condusive to keep things somewhat similar, thus picking a theme or color scheme for the party. We threw my girlfriend, Rebecca, a Paris themed bridal shower since her and her soon-to-be hubby will be honeymooning there. The colors we used for everything were black, white, and light pink. I decided to keep her bachelorette party in the same Paris theme and color scheme. 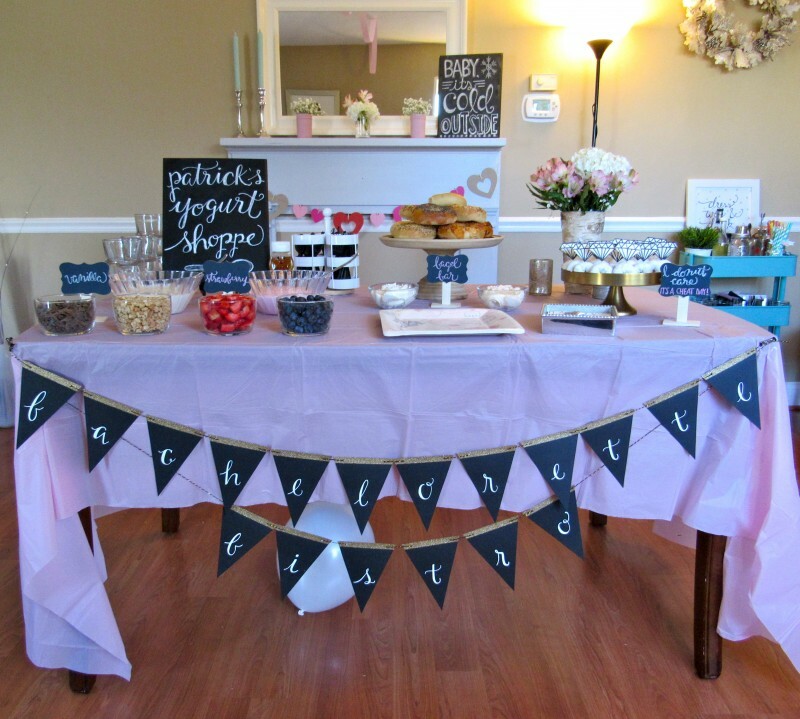 After all, you can not go wrong with a pink bachelorette party; it is super easy to find all of the essentials in pink! If you are having a hard time picking a theme, thinking about the bride’s wedding colors and honeymoon can be helpful. 3. Have Decorations // I can not stress this enough!!! Every gathering is more special with fun decorations. Nowadays with all of the DIY’s available to us via Pinterest you do not have to spend a crazy amount of money on decorations. Remember you can even get streamers, balloons, paper lanterns, plates, cups, and silverware from most dollar stores! The Dollar Tree is my best friend for these items. Some essential decorations include: banners, streams, funny signs/quotes, and balloons. 4. Party Favors // When all of your bride’s BFFs are in one place, it is nice to have some memorbilia from the weekend. There are many great favors to choose from that can be personalized for each friend while reflecting the bride’s taste. Some of my favorite favors: cups, koozies, bags, pins, tattoos, hangover kits, and t-shirts. For Rebecca’s bach bash we had cups, pins, tattoos, and hang over kits- you can see some pictures below. Thank you to Lauren for making our awesome hangover kits- make up remover wipes, gatorade, aleve, granola bars, and mints!!! 5. Choose Alcohol strategically // Everyone has their own alcoholic preference. My advice to the person who will be in charge of going to the liquor store is to ask each attendee what type of liquor, beer, & wine they prefer. Some people even have allergies to a specific alcohols. For Rebecca’s bachelorette we agreed on a bottle of rum and a bottle of vodka, and of course bottomless bubbly!! Be sure to have several mixer options too, a few sodas and a few types of juices should suffice. 6. Brunch // If you are the hostess you should consider putting a special brunch together one morning for all of the guests! Going out of town usually means eating most meals out, which can come with some challenges, i.e. picking the right restaurant, ensuring reservations (which I will get to in a second), hoping everyone likes their meal, the expense, and lastly, eating out tends to mean less healthy choices. Having a brunch at the place you are staying over (someone’s house or a hotel) makes for a wonderful morning. It can be as casual or as fancy as you would like it, keep the bride’s standards in mind. To me, there is nothing better than waking up, rolling out of bed, and enjoying a relaxing (key word) brunch with the ladies. 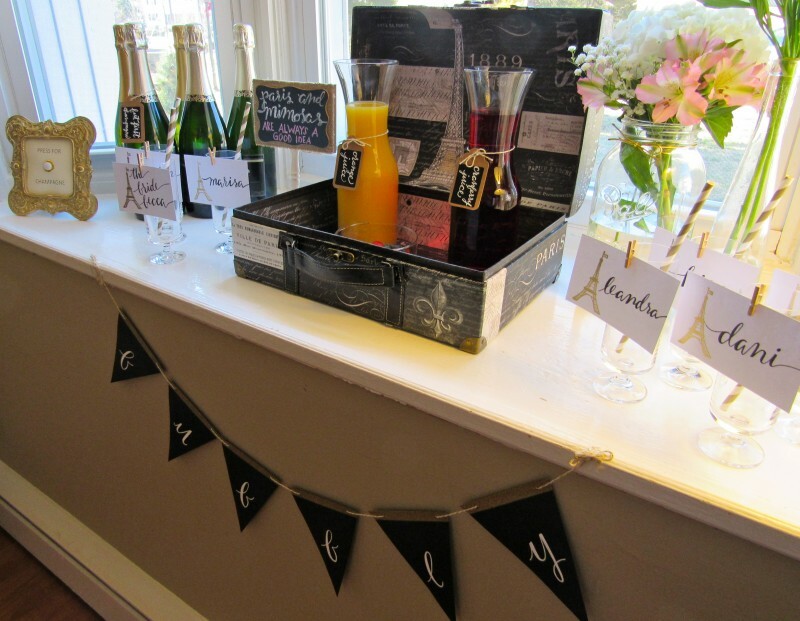 When hosting a bachelorette brunch it is nice to have a signature drink bar. I believe most gals can agree on mimosas, but there are other fun options out there too! For food, my rule of thumb is at least 3 options, a carb to soak up the alcohol, a healthy choice, and one sweet choice!! Carb ideas: bagels, toast, pancakes, french toast, or waffles. Healthy choices: yogurts, egg whites, salad, smoothies, some fruit, healthy cereal (low sugar/high fiber & protein) or oatmeal. 4. Food description signs with puns. See my photos below for ideas like “bagel bar” or “Patrick’s yogurt shop” or “I donut care, it’s a cheat day!” – Get creative!! 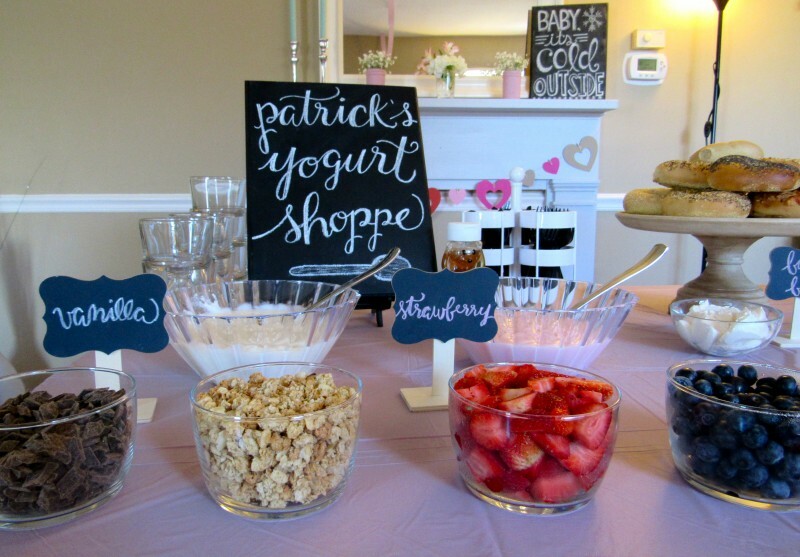 My sign said “Patrick’s Yogurt Shoppe” becuase the bride’s fiancé, Patrick, loves to eat yogurt. It a running joke with anyone who knows him well, knows he eats a yogurt every morning for breakfast and he likes to take his time. Gotta love you Patrick! 5. 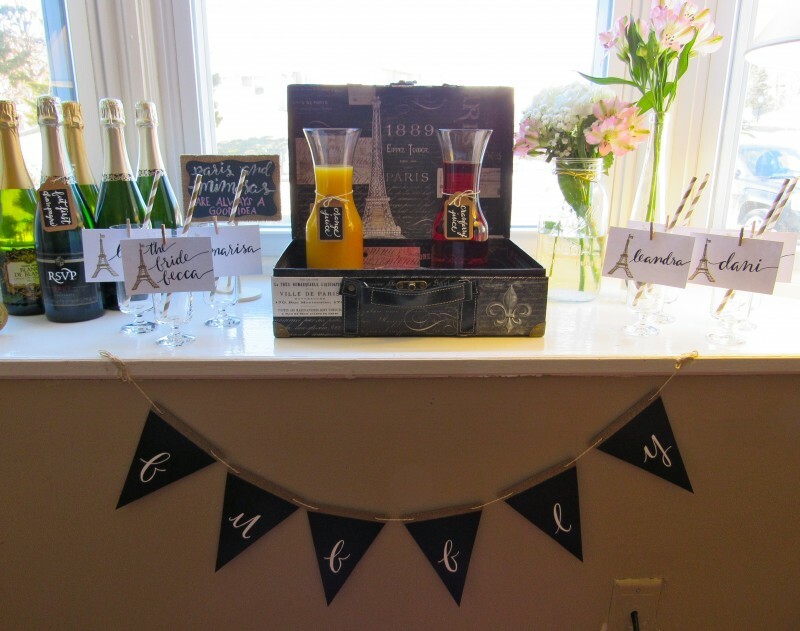 Other fun decorations to match the theme- for example, I placed the juices for the mimosa bar in a paris suitcase that I got from Home Goods, it looked darling if I do say so myself. 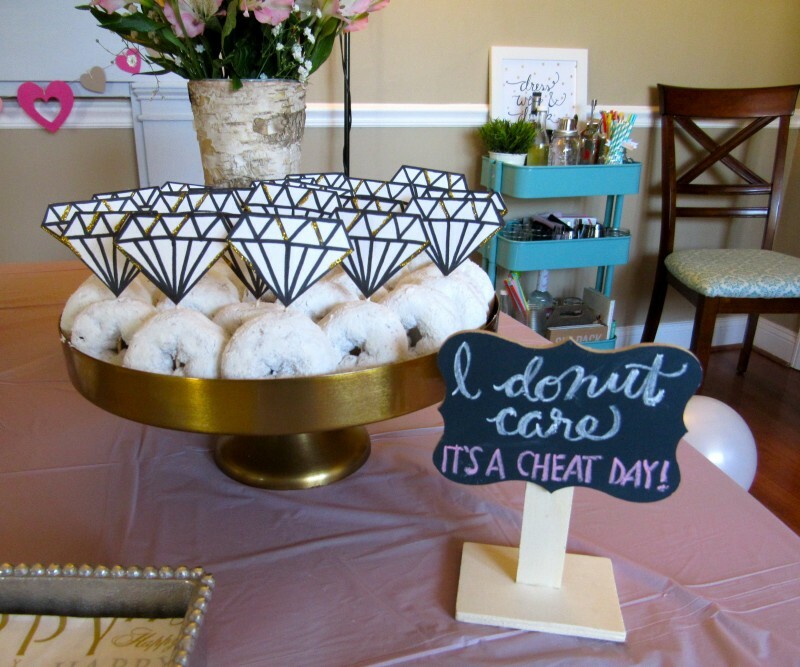 Drafts & Crafts made the chalkboard signs, painted signs, banners, name tags, diamonds for the donuts, and descirptive food plaques for the bachelorette party. See something you like? – send me a message or shop Drafts & Crafts on Etsy! 7. An Activity // I would highly recommend picking one “big” & “fun” activity that each lady will enjoy. Talk to the group and discuss some ideas. This activity will usually be an expense, so make sure everyone would have a good time. Some recommendations: pole dancing class, zumba class, winery tour, paint a sip class, cooking class, or a spa day. We were brave for Becca’s big activity, we surprised her with an hour and a half pole dancing lesson! It sure was out of our most of our comfort zones, but we had a ball and endless laughs. This will be the only picture that I share from out adventure, sorry, or maybe… your welcome?! We used Pole Pressure in Alexandria, VA. Our instructor was Erin and she was awesome!! There are several Pole Pressure Studio locations in the VA/DC/MD area. 8. A few games // Having 1 to 2 games make for some fun (and free) activities. 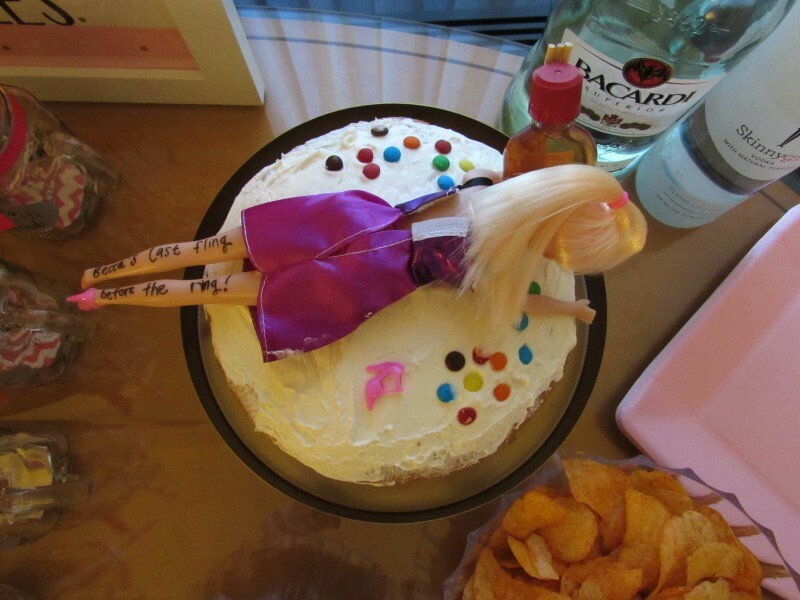 The bach weekend is supposed to be all about the bride so make her feel special with some fun games centered around her. We played an awesome game at Rebecca’s that I would highly recommend: Each attendee buys one piece of lingerie for the bride and then everyone puts their item in one bag. The bride has to open the bag and guess who gave her each piece… to keep things interesting, make sure take a big sip of her drink for each item she guesses wrong!! 9. Reservations // Make sure you do your research for a fabulous dinner! Pick a happening restaurant that has gotten great reviews, that someone has been to, or a place that someone has highly recommended. Make sure the place has several options to satisfy everyones appetite, for the picky eater or the gluten-free friend. And last, make sure to get a reservation in advance! If you are in a busy place, it could be really hard to get a reservation at the last second. 10. Gear for the bride // This is the one time you get to garnish your bride with pretty, fun, and obnoxious gear!! You want her to stick out from the rest of the group, it is her time to shine!! Having her wear a different color than the rest of the girls is always an option, but if she is not into that, than just make sure she shines! Bridal Gear Must-haves: A bachelorette or bride-to-be sash and a crown! Thank you Marisa for picking out cute gear for Rebecca!! 11. A hashtag // We live in a world where social media is everything… create a hashtag!! This enables all of the guests to share and see each other photos so months or even years down the road everyone can still look back at the celebration!! We used #byehackney, of course Hackney being Rebecca’s maiden name! Be creative, think of something unique and catchy. It should be personalized and there is not a million other pictures with the same hashtag from some random chick’s party. 12. 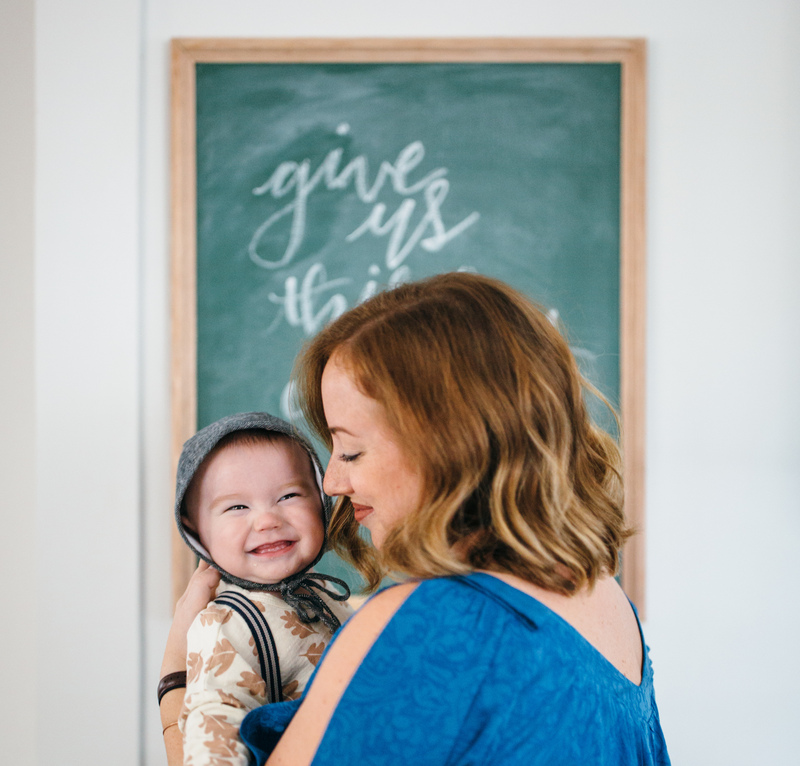 A planner(s) & a photographer // Appoint a planner or two. It is hard to plan something for a handful of women. In my opinion, It is easier for a few people take charge to make the reservations and plan the activities for the group. Have these people keep a Facebook message going with all if the information about details and costs. A Facebook message was so handy for the group of girls at Rebecca’s bachelorette party. We talked about games, activities, party favors, exchanged phone numbers (if we did not already have them), and reservations. My biggest advice is to keep everyone “in the loop” and about a week before the event give everyone one last run down of every.single.detail! Make sure there is a photographer in the group, not literally a person who is going to carry around their $500 camera, but a person who is more decided to taking photos and will share with the group. It is wonderful to be able to relive all of fun moments of a party through photo, so make sure the PG stuff gets captured… because my last recommendation is to make the bride a little scrap book or photo album of her bachelorette party!! Thank you to all the ladies who were apart of Becca’s bachelorette weekend!! The company was irreplaceable and I am so glad we spoiled our darling friend with love, laughs, and champagne!! I hope these 12 tips come in handy to ensure a memorial bachelorette party for your bride-to-be!! 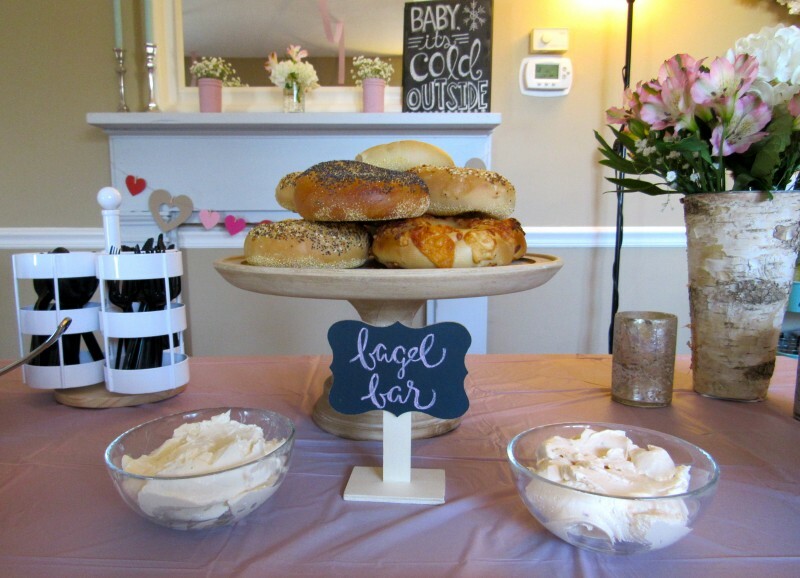 I believe these tips would also be great for hosting any party; bridal, wedding, birthday, retirement, etc. Recently I have been wanting to live in comfortable clothes. I am sure this can be attributed to the fact that it has been less than 30 degrees out. 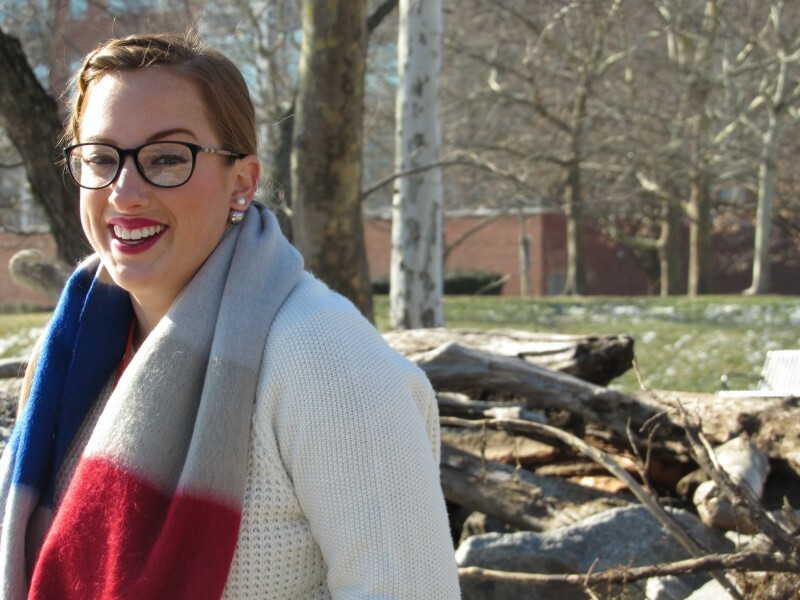 For now, chucks and cozy sweaters will do. 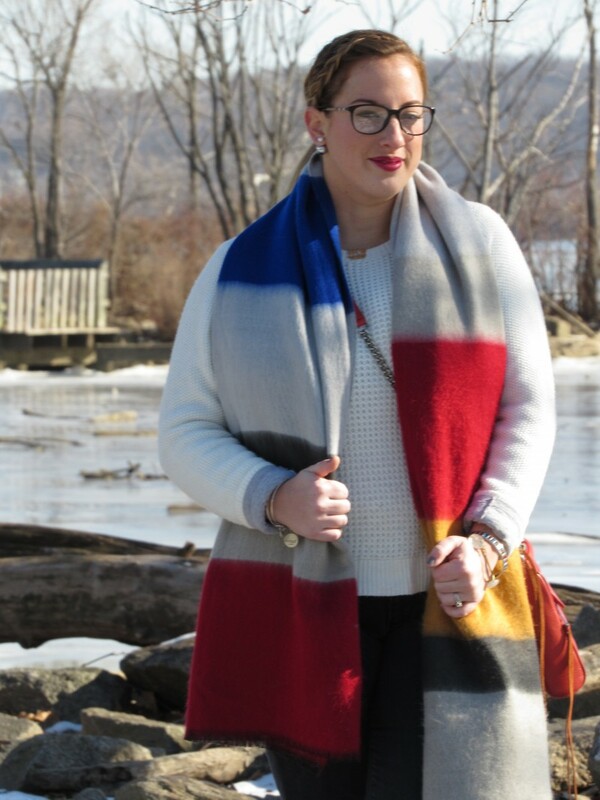 I am digging this primary color scarf from Zara.. it is more like a blanket & I love it. Yes, it is as bulky as it looks, but it has come in extremely handy this past week when it was in the teens!! I can’t get enough of my ILY couture dual pearl earrings. It is nice how versatile they are, today they were dressed down for a casual Sunday funday in sneaks. 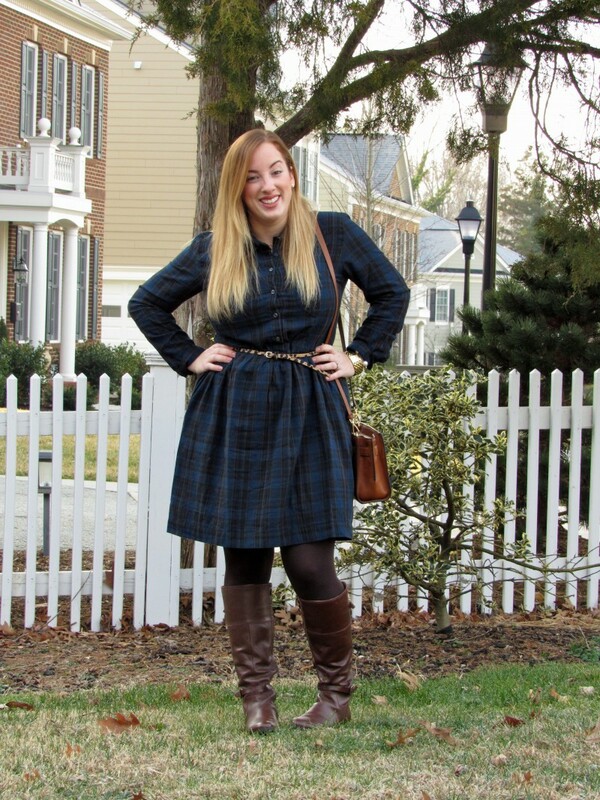 At 40 degrees and sunny, this was perfect attire for my weekend stroll through DC. 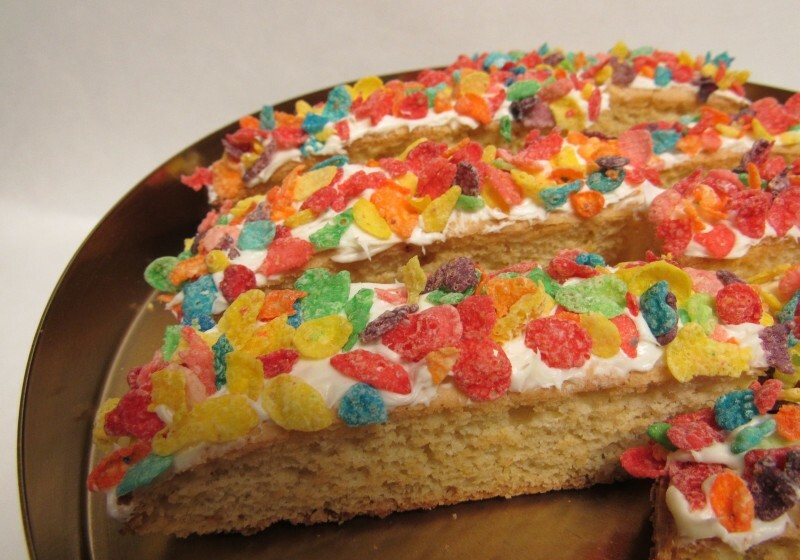 Who does not want to start their day with a cup of ‘joe’ and a biscotti covered with Fruity Pebbles?!?! I had this yummy goodness at my favorite new coffee shop in Boca. Of course, I had to recreate it, & I think I did a pretty darn good job- here are the details below! 1. Preheat oven to 350. Grease and flour a 11 x 8(ish) baking pan well. 2. 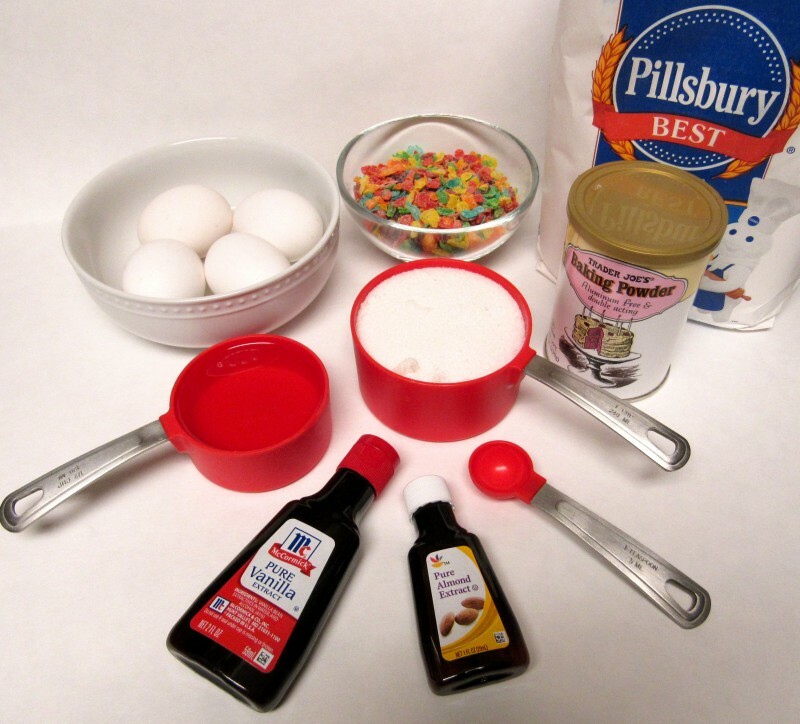 Combine the first 7 ingredients (all but powder sugar, frosting, & cereal) in mixer and mix on medium. 3. 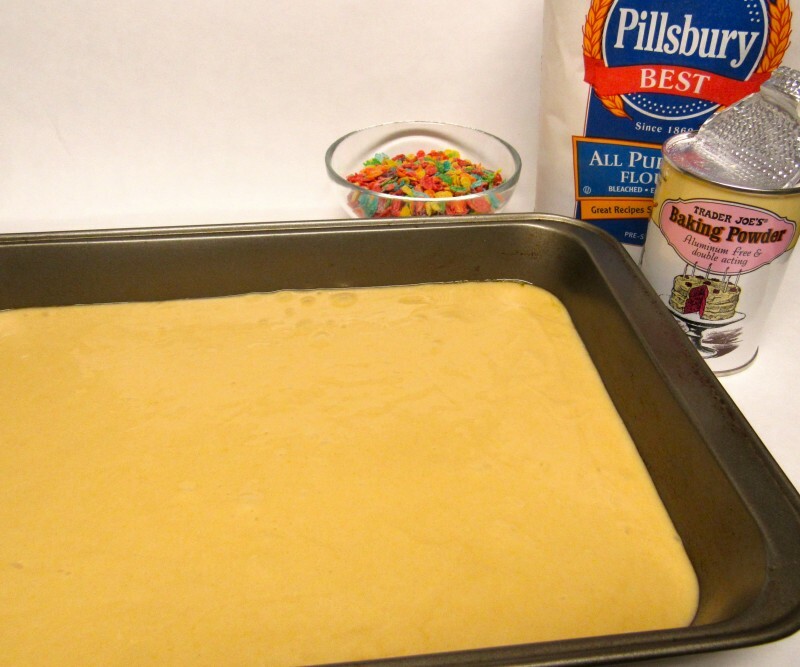 Place dough in a baking pan and spread the dough evenly. It should be about 3/4 inch think when spread evenly. 4. Bake for 25 minutes. It will look like a cake! 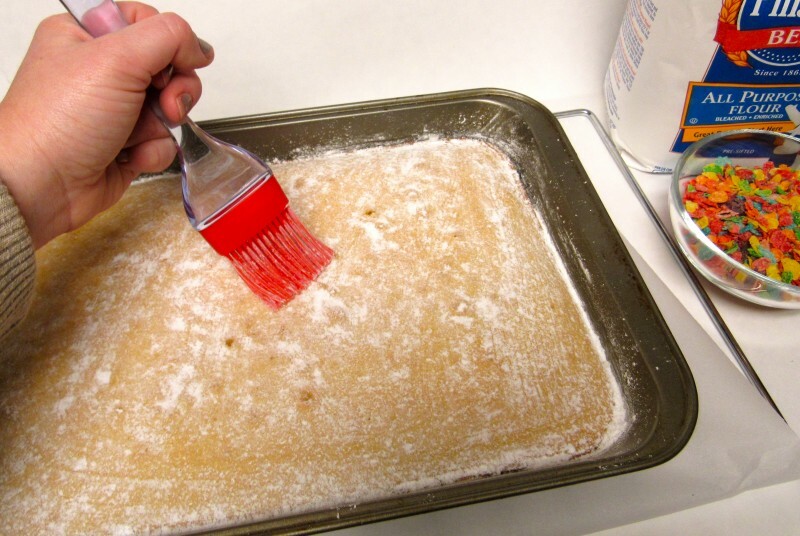 After taking the biscotti dough out, sprinkle the powder sugar on top, use a few drops of water to spread the powder sugar around and “glaze” the cake. 5. 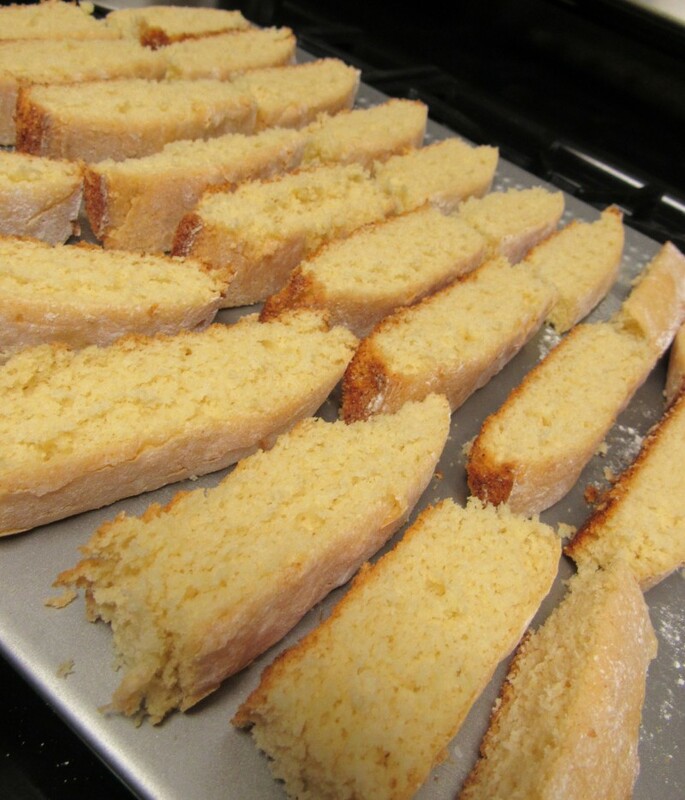 Let the biscotti dough cool for about 15 minutes before removing them from the pan. Use a sharp knife and go around the edges of the pan to gently separate the dough from the pan. This will ensure the dough comes out with crumbling. Cut a cross directly in the center of the pan and take out all 4 pieces with a spatula. 6. Cut the dough into biscotti’s about 3/4 inch thick. Place the cookies on a baking sheet and bake for an additional 5 minutes on 350, then flip the slices over and bake for another 5 minutes on the other side. 7. 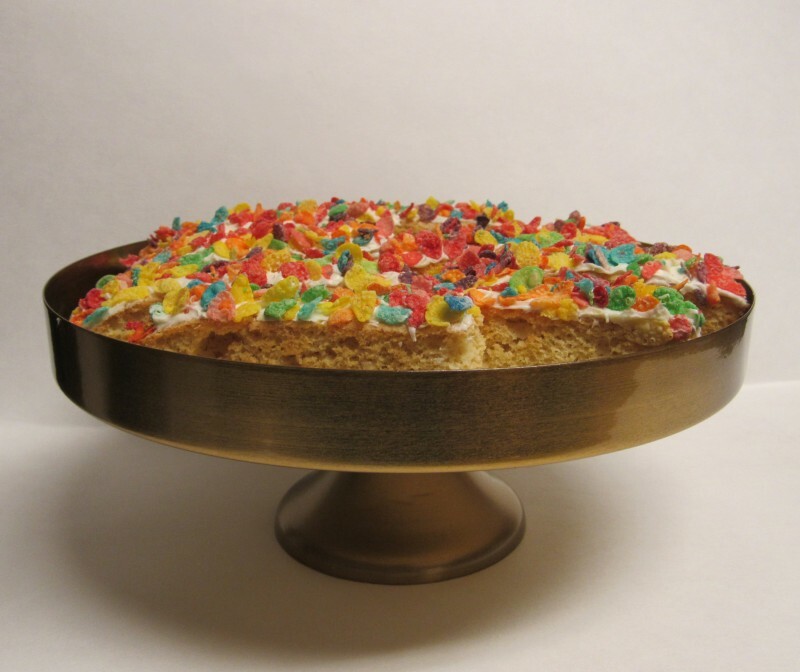 Let the cookies cool for 20 minutes before putting a thin layer of frosting on and rolling them in a bowl of fruity pebbles. 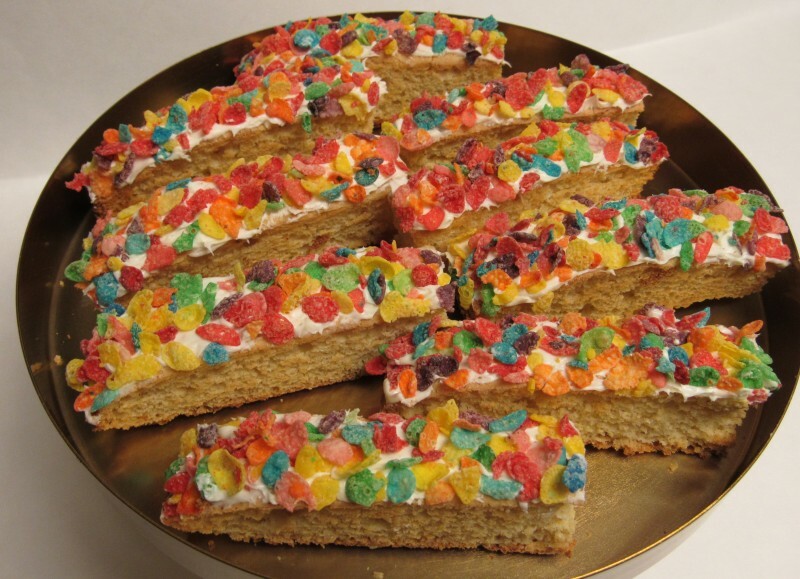 Ever since I had a fruity pebble biscotti at The Seed Boca (coffee and juice bar) when I was home for the holidays, I have been dreaming of the day I could have another! 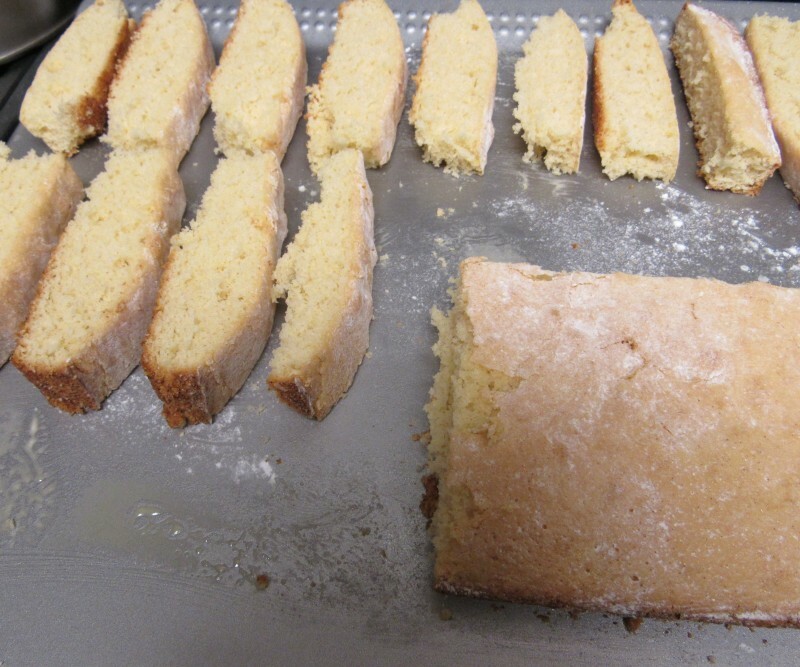 I built up the courage to create my own Italian cookie, biscotti recipe…. See the truth is, I am actually “half Italian” but do not usually care for biscotti’s unless I dunk can them in coffee because they tend to be too hard. So I set out to create a soft biscotti recipe and after much research, this is what I came up with. If I remember correctly they taste identical to the one I previously had. Go me!! These are soooo yummy! Enjoy one with your coffee at breakfast or with your night time tea for a little dessert.